We feature the biggest and best selection of live casino casinos offering the widest range of table game via full HD cams. You can play variations of blackjack, roulette, baccarat, craps and casino hold'em while interactive with live dealers. Live Dealer online casino games are a revelation because they let you play a range of state-of-the-art real money casino table games in real time on the internet (i.e. via live streaming) with actual human dealers placing the bets you've chosen to bet remotely from your computer or smart device. The bottom line is you can play them right now while interacting with fast, friendly and highly trained dealers and croupiers. Live dealer casinos are as close to the real thing as you can get. How Do Live Dealer Casino Games Work? Below you'll find the best live casino sites for Australians, i.e. casinos with the best and most engaging selection of live casino games, that are 100% licensed and regulated, accept AUD as a currency, offer worthwhile no deposit + welcome bonuses and have 24/7 customer support. There's a perception amongst some Aussie players that live dealer casino games are more complex than regular online table games. This is 100% false as you'll discover if you read on, as is the notion that you can't play games on a mobile smart phone or device, because you can. The way live dealer games work is that the games provider (which licenses them to online casinos) has a studio somewhere in the world full of actual table games, with shifts of trained dealers to run them. They have many HD cameras set up so you can enjoy play from multiple angles. These special live streaming cameras are designed to broadcast all game play 24/7 without interruption. While the live stream feed captures all of the game sights and sounds, you can only ‘talk' to the dealers via Live Chat in real time. (Always keep it clean or you'll be booted off the casino). From a gameplay point of view, once you've chosen a live game to play, you'll be taken to that table as your live feed is activated. You'll likely even be welcomed by the dealer. You'll get to view the table and dealer in real time, and place your bets as you would on a regular online table game. As part of the high tech live dealer software, your chosen bets as an active player are automatically fed to the dealer who physically replicates them on the table before dealing cards in the case of Blackjack or Baccarat, rolls the dice in Sic Bo, or spins the wheel in American or European Roulette. All of your game actions are instantly communicated to and carried out by the dealer, just as your winnings are instantly credited to your account. This is why live dealer games are a perfect combination of virtual casino and land casino games where you can enjoy the various benefits of each. Here on AustralianCasinoClub.com we only promote the best Australian live casinos with live casino promotions and the highest quality games from Evolution Gaming and others. Evolution is a world leader in live casino gaming which supplies games to many premier Aussie online casinos. When live dealer casino games emerged on the online gaming scene they were mainly limited to Blackjack, Roulette, Baccarat and Casino Hold'em. Today, however, thanks to live casino game vendors like Evolution Gaming that list has expanded to include a range of much more unusual games. These include Lightning Roulette, Dragon Tiger, Dream Catcher, Caribbean Stud Poker Texas Hold'Em Bonus Poker, Ultimate Texas Hold'Em, Sic Bo and Three Card Poker. Each is manned by a human dealer in real time and can be played 24/7 from anywhere in Australia with internet access. Played in land casinos for decades, in this card game where you chase 21 without busting is just as popular online. Most Australian casinos offer a variety of Blackjack live casino online real money games and variants, but to date Live Blackjack is mainly available in its classic or standard form. In Live Blackjack you can place a series of exhilarating side bets including 21 + 3, perfect pairs and insurance. In some live games you can even bet behind i.e. bet on another player's hand. This means that more players than just those seated (albeit virtually) at the table can play in a hand. Live blackjack table limits vary from casino to casino but are usually higher than in regular online Blackjack games. They range from as little as $1 right up to $10,000 per hand so whether you're a casual player or a high roller, you can bet you'll find a live Blackjack game with your name on. Another great feature of some Live Blackjack games is pre-decision where you can choose to Stand, Hit, Split or Double Down at the same time as the first player. The point of this is that it speeds up the game so you don't have to waste time waiting for each and every player to take their turn. If you're a fan of fast Blackjack that doesn't break the bank, be sure to look out for Blackjack Party from Evolution Gaming. This is billed as a fun-filled low stakes Live Blackjack game that unlimited players can be a part of – over and above the original 7 players already seated at the table. Go here for information on online blackjack. Being one of the world's most played online casino table games that is as popular in Monte Casino as it is in Las Vegas and everywhere in between, it's no surprise that Roulette has also been given the ‘live dealer' online casino treatment and is especially popular amongst Aussie Roulette fans. Due to live dealer software pioneers like Evolution Gaming, Live Roulette is making its mark. It has many games in its Live Roulette stable from European and American Roulette, to more unusual titles like Dual Play Roulette, Slingshot Auto Roulette, Speed Roulette and Immersive Roulette. In Live Roulette you won't miss a second of the action as multiple cameras capture all angles of the spinning numbered wheel and the ball dropped into it by the dealer. Like all live casino games, there's no need for random number generator (RNG) software as all outcomes generated in real time. Live American and European Roulette are as thrilling as their land casino counterparts, and then there are games like Speed Roulette where every round – from placing your bets to the ball landing in a numbered slot – takes just 25 seconds. At half the rate of a regular Live Roulette round, this means you can double your betting rate and thus chances of winning. Table limits depend on the online casino and the version of Live Roulette you choose to play. Some games have a chip size that range from a few cents while others have table limits that can reach into the tens and even hundreds of thousands of dollars. You'll find games to match your wallet. Go here for information on online roulette. Though arguably not as popular as Blackjack or Roulette, Baccarat is still a much loved casino table game and often found in land casinos as it is in online casinos. So it stands to reason that Live Baccarat would find a large and loyal fan base in Australia and beyond which it has in fact has. At most rated Australian online casinos with live dealer games, you'll likely find Live Baccarat. Just like its contemporaries, these games are overseen by human dealers in real time who you can converse with over live chat. Plus they're live-streamed by multiple cameras to capture all angles. One Baccarat move in particular is subject to multiple angles and slow motion in certain cases – “the Squeeze.” Up to 15 cameras capture the moment the dealer slowly reveals your face down card (if you've made the biggest wager of the hand) which will determine if you've won or not. A variant of Live Baccarat fast gaining ground Down Under is Live Speed Baccarat (pun intended). In this game every round from start to finish is finished in just 27 seconds compared to regular Live Baccarat which takes 48 seconds per round. This means Live Speed Baccarat is 56% quicker. Especially popular in Asian land casinos, live casino online Asia Baccarat has been described by many Asian casino fans as ‘authentic.' While it's hard to beat the vibe of land casino Baccarat, Live Baccarat titles from Evolution and co are closing the gap between land and virtual games. Finishing out the ‘Rat Pack' of live casino games is Casino Hold'Em, a fun and casino-friendly version of the popular 5-card poker variant Texas Hold'Em. Unlike in Texas Hold'Em where you play against other players, in Casino Hold'Em you only go up against the dealer – not the players. Like its contemporaries, there is little difference between regular Casino Hold'Em and Live Casino Hold'Em. So if you're an old hat at the former, the latter should be a breeze to master, and much more fun, as you're playing against another human being in real time - albeit remotely. To add to the excitement, Live Baccarat from Evolution has an extremely lucrative side bet including the Jumbo 7 Jackpot side bet. This gives you the chance to win potentially the world's largest (being uncapped) Jackpot at a live table game if you manage to make a 7-card Straight Flush. What's particularly great about the Jumbo 7 Jackpot side bet is that it will still pay you out even if you fold or are beaten by the dealer. No other live dealer game has such a potentially large and life-changing jackpot which is why Live Casino Hold'Em game is going great guns Down Under. Like all other live dealer games in Evolution's suite, all Live Casino Hold'Em games are run by fast, friendly and welcoming dealers who are only too happy to converse with you over Live Chat. Betting limits range from 50c to $10, however some casinos offer higher limit Live Casino Hold'Em. You can do just about anything on your phone or tablet, including play the latest live dealer online casino games for real money. As long as you sign up with a 100% responsive virtual casino i.e. a casino that can be accessed on multiple platforms i.e. 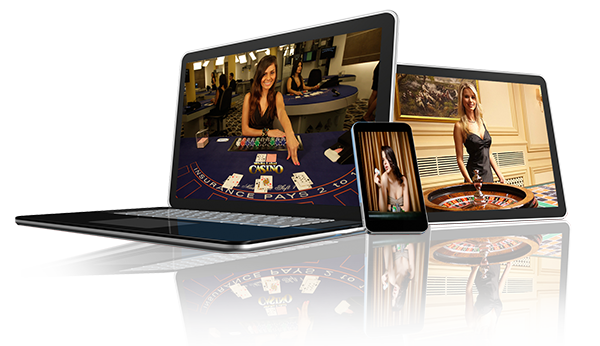 PCs, laptops and smart devices, you can enjoy a wide variety of live-streamed live dealer casino games on the go. This has only been possible fairly recently with the evolution and growth of smart phone technology; internet speeds, reliability and availability, and cutting edge title from successful online casino software developers like Evolution Gaming. The result is real money games you can access and play on your smart device conducted by real dealers in real time. Not all Australian online casinos have live dealer games in their suites, but most of the casinos we promote here do. These live dealer mobile-friendly casinos are all licensed, accept AU$ and have 100s of best in class casino games from multiple recognised and respected software developers. They also offer generous no deposit, match and reload bonuses, have 24/7 customer support and accept a multitude of safe and trustworthy deposit and withdrawal methods catered to Australians. In short they're just the ticket if you're looking for the best mobile-friendly live games. Despite having a human dealer, live dealer games are very similar to their online casino counterparts with one major difference – time limits. Where traditional online table games don't rush you to play, live games give you 30 seconds to place your bets etc. or miss your turn, so speed is crucial. You can play live dealer casino games on just about any smart (internet–enabled) phone or tablet regardless of its make, model, operating system (OS) or internet browser. That's the beauty of the virtual casinos of today – most are designed with a “one size fits all” philosophy. In other words, provided you're of legal gambling age, have the means and method to fund your Aussie casino account, it doesn't matter how you connect to the casino just that you can connect. Live dealer games for mobile are designed to be safe, flexible and convenient. For instance, you can play live casino games on an Apple iPhone or iPad powered by iOS that runs on Safari, or on a Windows-powered Nokia that runs on Microsoft Edge, or on a Samsung Galaxy powered by Android that runs on Google Chrome, and virtually anything else. The key to the best live dealer games is finding the best online casinos, since the best online casinos have the best games. The trick, of course, is to find said best casinos, which is why we've got a crack team of reviewers who track down, review and feature only top Australian live casinos. They achieve this by applying a tried and tested set of questions to every Aussie casino they find, and only if the casino ticks off every last one on the list does it make it onto this page for you to sign up with. Software – Is the software provider well known and renowned for producing high quality, high paying and entertaining titles? Games - Does the casino offer a decent variety of live casino games and/or variants? (At least four is acceptable). Bonuses – Does the casino offer enticing and generous new player bonuses by way of a live casino no deposit bonus and/or a welcome bonus? Live Stream – Is the live stream of a set of live dealer games constant, crystal clear, stable and reliable all the time? Dealer – Is the live dealer fast, friendly, courteous and engaging at all times making it a pleasure to spend time playing at their table? Payments – How quick, convenient and easy is it to add funds an online casino so you can play its live or any other games? Support – How efficiently and fast are your queries or issues handled by the casino's customer support agents? What's the difference between online and live casinos? A live casino is pretty much identical to an online or mobile casino except that it also has a selection of live dealer games i.e. fully interactive casino table games including Blackjack, Roulette, Baccarat, Casino Hold'Em and others that are live-streamed in real time over the internet that are run by human dealers. Some people refer to online casinos with live dealer games as live casinos. Online casinos with live games usually list them under their own category so you can tell at a single glance if they have them or not. These days live casino games are offered by most top online casinos Down Under. Are live casino games secure to play? Absolutely. Between the online casino game vendors that produce live dealer games and the casinos that offer them to players, the levels of safety and security are at their highest. This is because it is crucial these games are stable, reliable and virtually unhackable at all times. In fact, security is vitally important because being live-streamed and solely for real money (unlike regular online casino games which are available in real money + fun play), live casino games wouldn't attract a single player if they were unstable and unreliable or dropped the connection in between bets and actions. Add to that, all of the live casinos featured on AustralianCasinoClub.com have been vetted and tested and found to be 100% fair, safe and secure, and that includes their live games. What is the best live casino game to play? This is an impossible question to answer because it all depends on your personal casino game taste. Although there are many more, the four most common and popular live casino games available at online casinos are Live Blackjack, Live Casino Hold ‘Em, Live Roulette and Live Baccarat. It's not hard to understand why if you consider that these also happen to be amongst the most popular table games at bricks and mortar casinos across the world, including Australia. Each of these games is staffed by well-trained, professional and friendly dealers, who man regulation table games just like you'd find in any land casino. So whether you like counting up to 21, you prefer to beat the banker, you love watching the a real numbered wheel being spun in real time, or love casino style poker action, all of the live dealer game casinos featured on AustralianCasinoClub.com have got you covered. Are live casinos legal or illegal? As long as a live casino i.e. an online casino that offers live dealer games has a valid license from a recognised and reputable online gambling jurisdiction, it can be considered 100% legal if accessed from a country or territory with a liberalised i.e. regulated online gambling industry. Can you play blackjack online against a live dealer? Absolutely, that's the whole point of playing live blackjack – or any other live dealer game for that matter - to play against an actual human dealer standing behind an actual regulation land casino game. The great thing about live casino games is you can access and play them wherever you live in Australia. From the comfort of your own home, work environment or even while you're on the move if you have a smart phone or tablet, you can go up against a live dealer and even communicate with them in real time using live or in-chat. As long as you keep the conversation clean, they'll engage with you as they process your bets and deal cards on your behalf. What types of games can you play in a live casino? The most common live dealer games offered at live casinos tend to be Roulette, Blackjack, Baccarat and Casino Hold'Em as they are typically the most popular amongst players Down Under. That said there are some Aussie-friendly online casinos that offer these titles and many more. For instance, depending on the casino and more importantly which live casino game vendor it's supplied by, you may be fortunate to be able to play such live games as Live Caribbean Stud Poker, Live Three Card Poker, Live Ultimate Texas Hold'Em and others. Remember, before you attempt to play any live dealer game or any other online or even land casino game for real money, always ensure you fully understand the respective game's rules, odds, betting requirements and payout structure. No, they're not. Live casinos are banking on the fact that players will be attracted to live dealer games because they're just that; live-streamed with human dealers. These days word about any live casino exhibiting suspicious activity, questionable rules or dodgy game play will be all over the internet faster than the casino can save its reputation. For this reason it's in the best interest of every reputable live casinos (like those we recommend on AustralianCasinoClub.com) to operate honestly, fairly and transparently to entice players rather than scare them away. What is the most innovative gambling company and why? As if regular online casino games are not innovative enough, live casino games have taken remote gaming innovation to a whole new level, and one live casino game developer in particular – Evolution Gaming – is leading the way in this relatively new and dynamic sub-section of online casino gambling. Born in 2006 by a team of online gambling visionaries, Evolution Gaming has grown and evolved along with the very technology its uses to offer some of the best and most popular live dealer games in the world. With live casino studios in Latvia, Riga, Vancouver and Malta, Evolution has the facilities and capacity to live stream its live variants 24/7, 365. These include Live Blackjack, Live Three Card Poker, Live Ultimate Texas Hold'Em, Live Caribbean Stud Poker, Live Casino Hold'Em, Live Lightning Roulette, Live Baccarat, Live Texas Hold'Em Bonus Poker, Live Dream Catcher, Live Dragon Tiger and Live Roulette. What are cool tips for live online casino? Always be polite to the dealer and your fellow players. Don't and you'll embarrass yourself and risk being kicked off the site for good. Ensure your internet connection is fast, reliable and stable. Also make sure it can handle the high amount of bandwidth required for hours of real time live-streaming action. Set a daily budget and stick to it. Even the best players have off days so if you find yourself on a losing streak rather than chasing your losses with more deposits, logoff and come back another day. Play with some kind of strategy. To help offset the house edge (casino advantage) present in all live casino games, learn everything you can about the game and put in place some kind of strategy that will converse your chips and maximise your winning potential. Don't play live casino games if you're tired or fatigued. Unlike regular online casino games where you can take your time between hands, live dealer games are much faster so you have to be on the ball. If you're not at your best you're more likely to make mistakes that can cost you – literally.